1.A toy storage bag that doubles, as a play mat is every child's dream. Dolls, cars, balls, blocks and other toys can all be swiftly cleared away with one swing. 2.This toy storage bag measures 59 inches in diameter and is made from pure cotton fabric.Purely a great gift for our kids. 3.In addiction,baby get used to throw their toys everywhere and dirty that after they play their toys, which always make mothers feel headache for they have to put in order effortlessly. 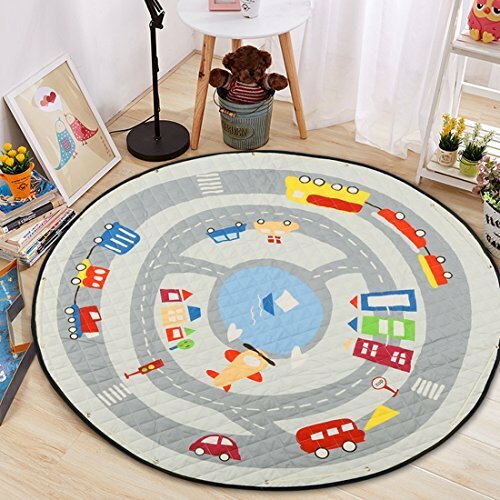 4.With this play storage mat,all the toys can be put into.When the children want to play the toys again, just release the rope and it come into mat from storage immediately.All the toys are displayed and not easy to get dirty. 5.Besides, when they finish playing, just pulling the rope all the toys are entirely packed.Very convenient and easy for mothers who are no longer feel headache with baby's toys. Back material:Point plastic of Anti-skid. We have been focusing on improving product quality and service standards, if any questions please contact us, we will help you within 24 hours to solve until you are 100% satisfied,everything will be a good solution, you can rest assured to buy them! THANKS FOR YOUR SUPPORTING AND ENJOY YOUR SHOPPING DAY! If you have any questions about this product by okdeals, contact us by completing and submitting the form below. If you are looking for a specif part number, please include it with your message.